At first I checked the dimensions of all components and see if they will fit. Because none of the parts are original, it takes some puzzling to fit everything in the available space. The transmitter subchassis is about 100mm wide and that leaves about 140mm for the meter with the switches left and right of the meter. Sounds easy, but the meterbody (the part that goes through the frontpanel) is 57mm. The ceramic 3-position switch also measures about 57mm across its contacts, leaving 26mm for the 6-position meter switch. And that is not enough. Front view of the transmitter. See how close the switches are to the meter. 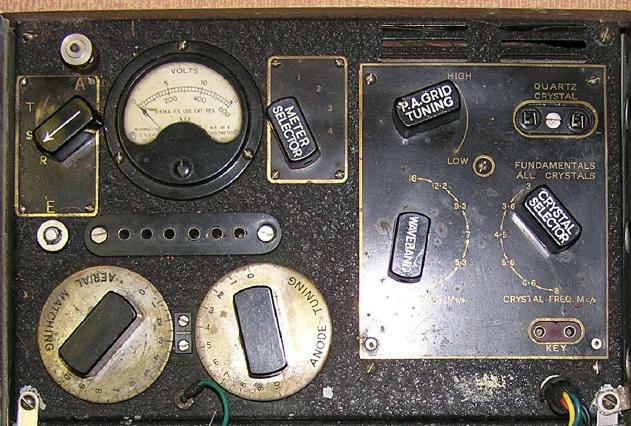 Nice bakelite knob, large enough to switch on a nuclear plant. 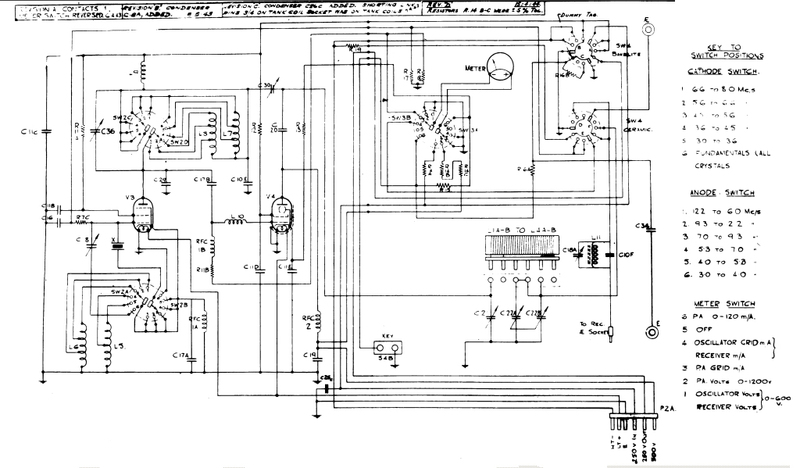 Draft drawing of the front panel layout. Looks like the BFO-capacitor, but this one has two mounting holes in stead of a mounting nut around the axis. The thread looked like M3 but I should have known: the diameter of the spindle was not 6mm but 1/4" and of course the mounting hole thread was not metric. Again, my special bolts-and-nuts-stock provided two bolts, ex DB-9 connector, that fitted. Now I have all the parts for the front panel, I can start working on the subchassis. In the original, the subchassis is mounted directly to the front panel. Probably both were less than 1mm thickness, but with 1.5mm printed circuit board and 1.5mm front panel, that will be too thick. So I used the same method als in the receiver: the subchassis is mounted with 5mm spacers, which leaves room for the mounting nuts and the key socket between chassis and front panel. 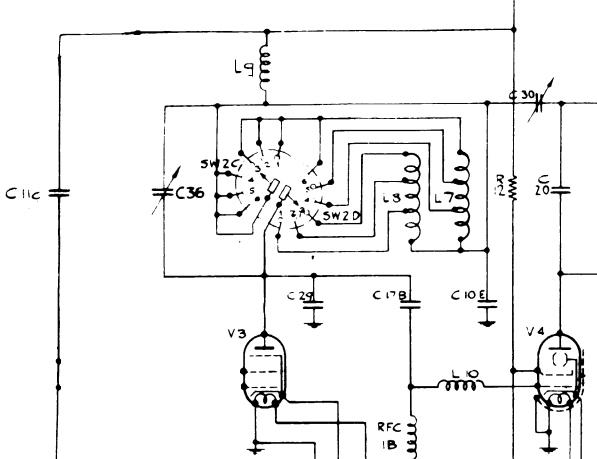 Here also is a isolated support for the grid tuning capacitor, which is at the 500V level. Subchassis front. The cut-away on the lower left is for the power supply cable. Detail of the PA driving circuit. That would be pretty easy, except for components L9, C10E and C30. The reason is clear to me: C10E lifts the resonance circuit from ground and C30 routes a bit of the anode-energy back to the input. That is called neutralization and compensates for the grid-anode capacitance, which can be considerable with these kind of valves, causing instability at higher frequencies. See the great explanation at this website. My problem is L9. According to my calculations it should either be less than about 500nH, or greater than 12,5uH. Otherwise it will resonate with the 220pF capacitor somewhere between 3MHz-15,5MHz where the transmitter has to operate. Next: calculating the coils L7 and L8. 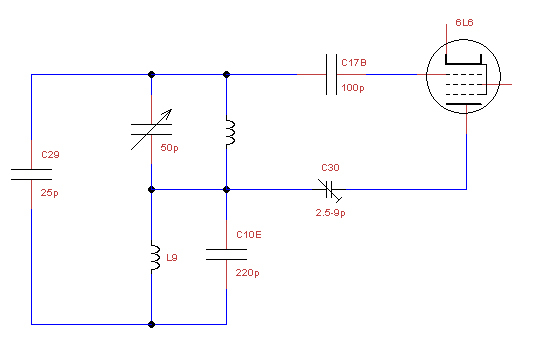 I measured the capacitance of the circuit and used that to calculate the required inductances. I used some old grips from Ikea cabinets als a coil former; the diameter was 9.7mm. I cut off some straight parts of 35mm length and used the Mini Ring Core Calculator to determine the number of turns. And that matched pretty well! Coils for the grid tuning. The first parts in place. Anode voltage when in frequency doubling mode. The doubling is clearly visible. The picture is taken using a 7020kHz crystal, doubling to the 20m band. There is less energy than in fundamental mode, but that was to be expected. Vertical resolution is 10V/cm so this represents 35Vpp here. When in fundamental that is about 55Vpp. This is without PA valve, but looks good so far. Top view of the transmitter.